Mission: Through our baptism, we, the family of Saint Ambrose Roman Catholic Church, are chosen and called to be the body of Christ. As a community of faith, we gather to give thanks and praise to God through prayer, worship, and the celebration of the sacraments. Gifted by God and guided by the Holy Spirit, we continue the mission of Jesus by sharing our faith and reaching out to others in justice, mercy, and love. Together, we strive to grow stronger in our love for God and one another. On the first Sunday of the month, St. Ambrose parishioners show their generosity by “brown bagging” donations for the local food pantry. Please consider bringing a bag of non-perishable food or cleaning products. Just leave your bag in the vestibule as you arrive for Mass. Thank you! If you have a special prayer request, please contact Trish Danku. You can call Trish at home in the evenings at 330-802-2463 or email her at gdanku@neo.rr.com. Please put St. Ambrose Prayer Team in the subject line when you email her. We would also like to invite you to become a member of the Ministry of Care. There are no meetings to attend – all that is required is 5 to 10 minutes daily in prayer to ask for God's blessings on those people who are in need of prayer. If you are interested in joining, please call the rectory. The R.C.I.A. is a formation process for adults (18 years of age and older) who wish to become Catholic. Classes are held in the rectory or church hall for learning, faith sharing and fellowship. The culmination of the R.C.I.A. is at the Easter Vigil at which time we will celebrate the sacraments of initiation: Baptism, Confirmation and Eucharist. If you or someone you know may be interested in becoming Catholic and being involved in the R.C.I.A. classes, please call the rectory at 330-527-4105. The Rosary is prayed at 4:25 p.m. each week before the Saturday Vigil Mass. Everyone is invited to attend. We will be celebrating the Sacrament of Reconciliation/ Confessions at St. Ambrose this Wednesday, March 20, from 7:00 p.m. to 8:00 p.m. in the church. 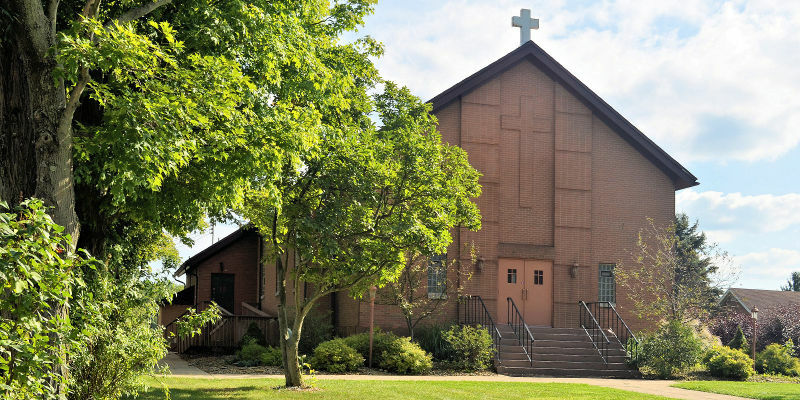 The Lenten Communal Penance Service will be held on Tuesday, March 26, at St. Patrick (Kent) at 7:00 p.m.
St. William Parish, 5411 Mahoning Avenue, NW, Champion, is sponsoring a Lenten meal every Friday to April 12, in the church hall from 4:00 p.m. until 7:00 p.m.
Catholic Men’s Fellowship of the Diocese of Youngstown will host its annual men’s conference at St. Thomas Aquinas High School on Saturday, March 23. Please visit www.cmfdoy.org for more information. The A & R Society is putting together a new St. Ambrose cookbook to celebrate our 75th anniversary. We would love for you to send us your favorite recipes. There will be several ways to submit your recipe. You can email them to us at stambrosecookbook2019@gmail.com. There is a form that will be located in the back of the church along with a box to put them in when you are done. Or if you wish, you can type them directly into the website at www.typensave.com - user name: stambrose - password: potato768. Please include your name and phone with all submissions that you email or write out in case we have any questions - only names will be listed in the book. All submissions need to be in by April 7. For more information or questions, please contact Robin Popek at rapop428@gmail.com or 216-403-5474. St. Ambrose Knights of Columbus Council will be sponsoring an Easter Egg Hunt for the young children on Saturday, April 13, at 10:00 a.m. following the youth group pancake breakfast. The Christ Renews His Parish St Ambrose/St. Michael Women's Renewal will be held on May 4-5 at Camp Asbury. The Portage County Friends Chapter of Ronald McDonald House of Cleveland is collecting pull tabs from beverage/soup cans. The proceeds from these tabs go directly into the fund to help families staying at the Ronald McDonald House. Please encourage your family and friends to save. There is a basket in the vestibule to place your pull tabs. Grades K thru 8 are collecting canned goods and paper products until April 10 for the food cupboards. Students should bring items to PSR. The class collecting the largest number of items per person will celebrate with breakfast at McDonald’s. Our PSR students are selling Malley candy bars in five varieties plus taking orders for all types of candies and nuts, attractively packaged for holiday gift giving. If you would like to purchase any candy, please contact a PSR student or call the rectory at 330-527-4105. Order forms are due by Sunday, March 31. Over 100 children and young people, preschool through grade 12, will sign up this fall to learn more about Jesus and the Catholic faith. You can help them learn and grow by becoming a catechist for Faith Formation. With classes offered Sunday mornings from 10:00 a.m. to 11:00 a.m., you will find that this fits your schedule easily. As you nurture the faith of our young, you will learn and grow as well! As one long-time catechist put it, “I learn so much from the children!” We provide you with textbooks and an instructor’s manual, as well as supplies and support. Classes begin on Sept. 8. If interested or for more information, please contact Sue Pickett at 330-527-4105 (rectory) or 330-204-5568 (cell). St. Ambrose Council 11801 - Meets the second (business) and fourth (social) Monday of each month at 7:30 pm in the St. Ambrose hall. Windham K of C - The Windham K of C meets the second and fourth Monday of each month at 7:30 pm in the St. Michael hall. Please check the weekly bulletin for schedule changes. St. Ambrose Knights of Columbus are teaming up with J. A. Garfield Schools for a "Box Tops for Education"/"Labels for Education" drive. The school receives money for every UPC label and box top submitted. There is a collection box in the back of the Church for you to deposit your labels. Please help the kids and JAG Schools. Thank you! The Windham Knights of Columbus has started an ongoing food drive through St. Michael's Church. Canned vegetables, canned soup, cereal and peanut butter are the most needed items. However, any non-perishable items are fine. Please check the expiration date before donating. We would like to thank you for your generosity in advance. Our annual Bike Blessing at St. Michael is scheduled for Sunday, April 28. The success of the Bike Blessing is dependent upon your help!! As this event has grown (approximately 800 motorcycles last year), our need for help BEFORE, DURING and AFTER has increased! We also need picnic sides (salads - tossed, potato and macaroni & desserts - cookies, cupcakes and brownies), pop and water. We need volunteers to assist in many areas. Contact Tricia at 330-326-1230, Karen at 330-326-2972 or Tess at 330-978-1160. If you would like to rent St. Michael Parish Hall, please contact Barry Cree (330-326-2420). When sending any mail to St. Michael Church, please use the following mailing address: St. Michael Church, 10692 Freedom Street, Garrettsville, OH 44231.